I love macarons. I love making them, eating them, Reading about them, you name it. I'd like to share a really great story about macarons with you. It's written and photographed by Cristina Lasarte and presented on the Hip Paris blog by Genevieve Sandifer. Thank you Genevieve for sharing your wonderful work. Cristina Lasarte is the voice behind the gorgeous blog From Buenos Aires to Paris. Her mouthwatering photography and playful recipes, inspired by her Argentinean heritage and her new life in France, keep us coming back to her blog again and again. 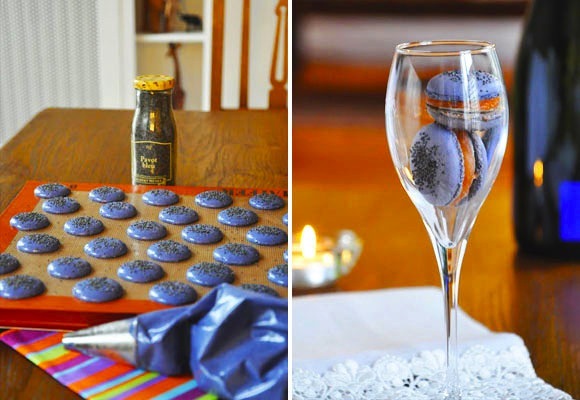 Here, she shares her recipe for Blue Smoked Salmon Macarons, the perfect amuse-bouche for your next elegant get-together. Geneviève Sandifer— Half-French, half-American and 100% cool, Genevieve is based in New York, but visits Paris (and her family) as often as possible. Geneviève’s finger is always on the pulse of the latest cultural happenings. From insider tips on how to navigate Parisian etiquette to artsy recommendations and restaurant reviews, she knows what’s up and she’s happy to share—if you can keep a secret. The Hip Paris Blog is great, and I hope you'll visit it, and enjoy it as much as I do. It was exactly my fourth post ever… Those who had been following my blog right from the very first day (if I did have any followers to speak of then) saw a shy Argentinean blogger producing some mauve macarons, photographed in a ring box. The photo was picked up by Foodgawker and before I had even really understood what blogging was about, the world was looking at my blog: Singapore, Alaska, Arkansas, Russia… One thousand clicks in two hours. That was back in 2009. You can still find the recipe here, and in Audrey Hepburn’s company here. Savory macarons are not my invention. In fact, the “father” of modern macarons, Pierre Hermé, started playing with the idea of giving traditional sweet macarons a savory twist long ago. One day, I thought of making something elegant… Something with salmon, and something black… Yes, black macarons! I went to G. DeTout to buy black food coloring. Back home, I started adding tiny quantities of this coloring to my Italian meringue, and it started turning…mauve. Mauve? Another half coffee spoon… deeper mauve! I paused and wondered: should I continue adding color, or stop here? I hate it when macarons dye my tongue! And this shade of mauve was so beautiful… And it matched my poppy seeds perfectly! Yes, the match was sealed. 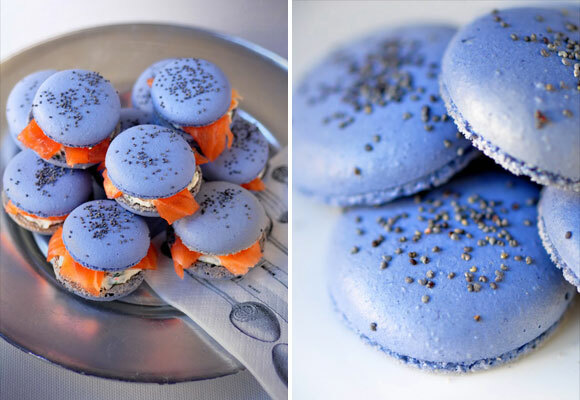 Today, my mauve salmon macarons have become a trademark of my Menu Malbec catering service. After all this time, I decided a new photo shoot was in order. After all, two years of blogging had improved my photography skills. I have to admit that sometimes people look at me with a skeptical eye: “Salmon in a sweet macaron? Is the crust savory at least?” Until the first bite, when all doubts vanish! The savory macarons are here to stay… Not only with salmon, but with foie gras now as well…who could think of something more appropriate for holiday parties? Chicissime! 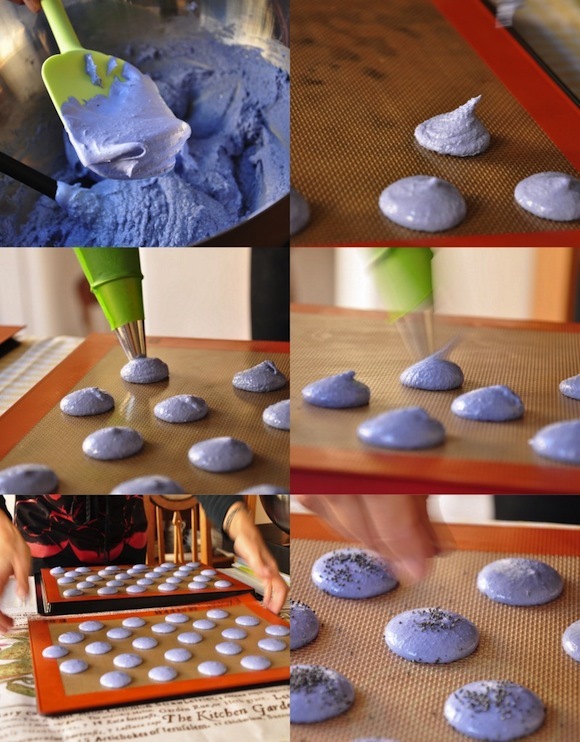 To make macarons, we use egg whites that have been kept in the fridge for at least one day…Why? Egg whites from fresh eggs have a firmer structure, they are less supple, and for the process of blending the egg whites with the other ingredients, “old” whites yield better results. Mind you! Remember to take the egg whites out of the fridge a few hours before starting so that they are at room temperature. Sift the almond flour and icing sugar together. In a large bowl, fold 2/3 of this mixture in with the egg whites, and the food coloring. Remember that colors fade with baking so don’t be afraid if the color is a little intense at first. Combine the ingredients briskly. Don’t worry, nothing dangerous can happen at this stage! Put the whites in the bowl of your stand mixer. In a saucepan, bring the water and sugar to 115°C. When your syrup reaches 100°C, start whipping the egg whites slowly into soft peaks. The idea is the whites should be ready the moment the syrup reaches the 115°C. Slowly, pour the syrup into the whites, and continue whipping until cool. Bravo! You have made an Italian meringue! Add 1/3 of this meringue to the remaining 1/3 of the almond powder and powdered sugar mix. Combine everything well. Yes! Don’t be afraid of actually crushing your meringue, this is what you are supposed to do here! Add the rest of the meringue in little by little. The final result shouldn’t be too firm or too runny! Congratulations! You have finished the “macaronage”! 1. The syrup should be folded with the whites at 118°C, this is why we remove it from the heat at 115°C….three more degrees will be reached by the time you move the saucepan from the stove to the stand-mixer. 2. If you use two baking sheets, instead of one (one on top of the other), you will prevent excessive drying…. Written by Cristina Lasarte for the HiP Paris Blog.All images by Cristina Lasarte.